i had 2 oil stains on my drive after leaving the solution on for 36 hrs i jet washed if off but it ha still has a stain on the oil has gone but its left a darker colour on the drive even after putting the drive cleaner on its still there what next? Colin Owens- RESPONSE from Smartseal. We spoke to our customer, unfortunately the oil resonsible for the leak was synthetic. We try to indicate as clearly as possible the product before purchase, it will not work on synthetic oil. Wow! What a product! My Peugeot has been leaking oil over my porous block paving drive way and porous block paving car park at work for nigh on 2 years, i tried some google recommendations: oven cleaner, cat litter, various other cleaners, wasted a lot of money on other oil removing products then stumbled across this smartseal stuff. with just one dose at work the ground in oil had disappeared (applied it on Friday, covered it over, hosed it down Monday morning - no sign of any oil. The driveway at home took 2 applications, that too has now disappeared from view. Very very impressed! If it was in a tin I would say it does what it says on the tin! Worked well on a heavy oil stain and easy to apply. This product definitely works - 10/10. I'm sure this product is brilliant for removing oil, petrol stains etc but it does not work on "Danish/Teak Wood Oil" that had inadvertently dripped and stained my stone slabs!!! Back to the drawing board to try and remove the spots. Absolutely brilliant. It removed an old oil stain from my concrete drive within 24 hours. This was recommended by a friend and I would have no hesitation in recommending it to others. The product arrived in 3 days from ordering, counting a weekend. Wonderful service. What a great company. 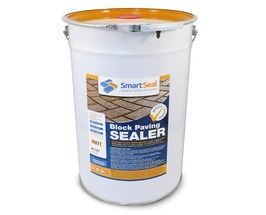 Had an OMG moment when I spilt oil over my drive and my neighbours......Bought this product and it was brilliant, the block paving is as good as new. I would highly recommend this product. easy to use, even smelt quite nice and works a treat ! I used this on a oil stain which was completely black & had been there for at least 2years you can no longer see where the stain was & i used surprisingly very little of the product! 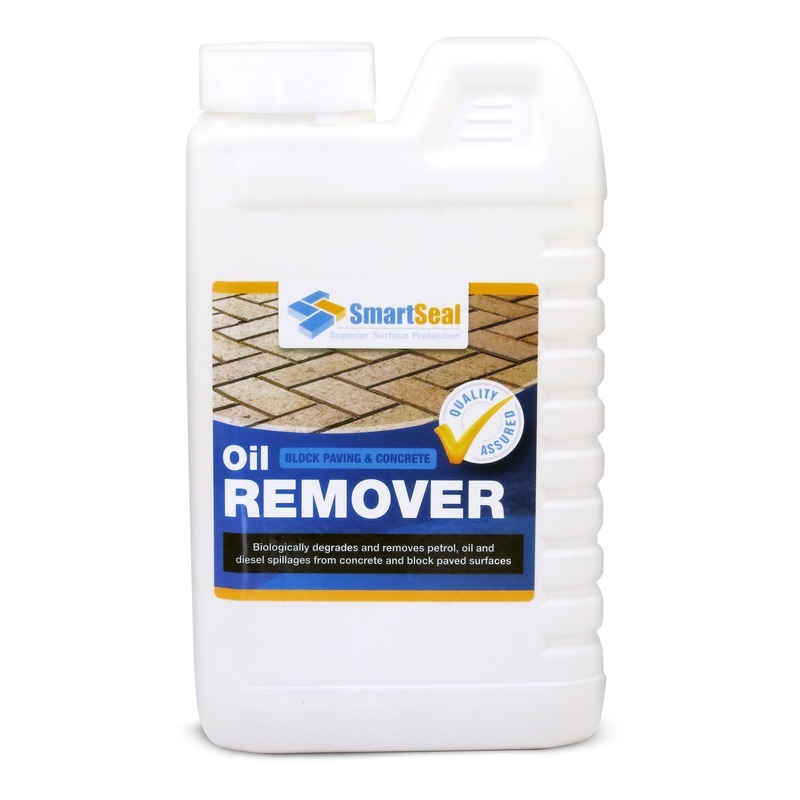 Oil Remover to remove oil stains on Block Paving and Concrete surfaces. A new bio-degradable approach to the removal of most oil stains* from block paving and concrete. 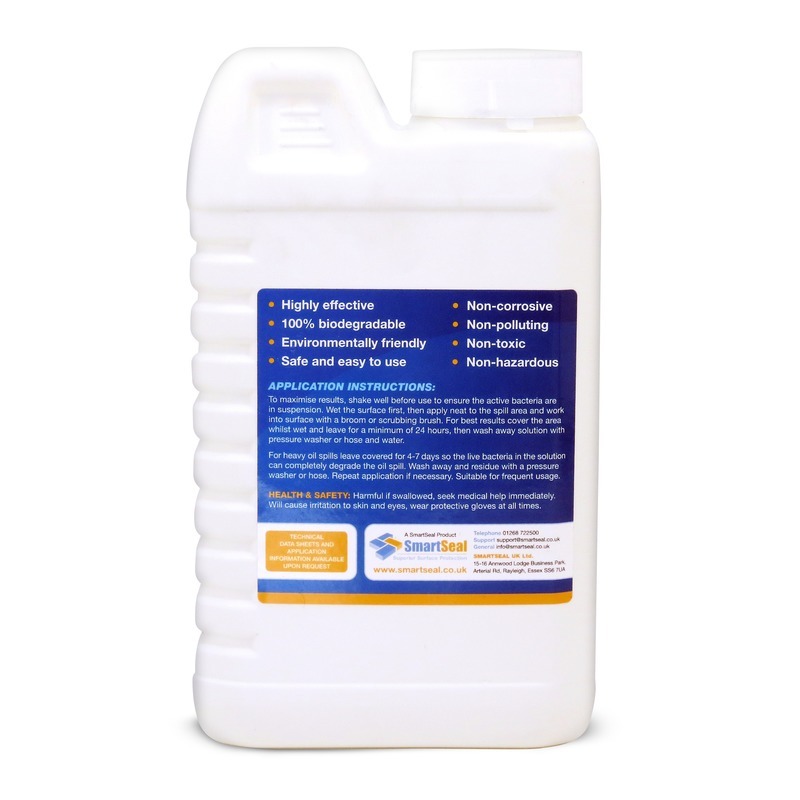 This biological oil stain remover removes and digests oil stains from floors, road surfaces, forecourts, driveways and equipment. Penetrates and lifts oil stains from even the most porous surface. Contains a blend of biological enzymes and bacteria to digest oil stains to completion. 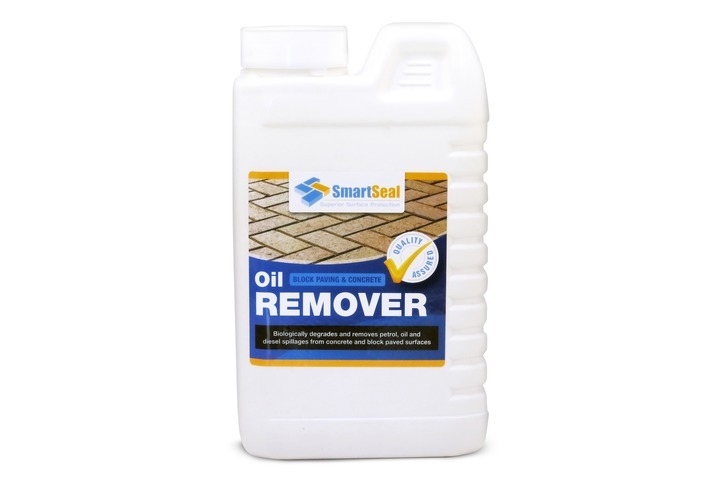 With an application rate of approximately 1 litre per square metre, Smartseal Oil Remover is simple to use and lifts oil stains from the most porous surfaces. Water wet the non-synthetic oil stain before applying Smartseal Oil Remover. Brush into the stain until the colour changes from white to brown. Apply neat to the oil stain, brush in and leave for minimum 1 hour. For bad or old stains, apply product and cover affected area for a few days prior to removal. Water rinse to remove residue and if required absorbent powder to prevent oil spills to surface drains. Sweep up and dispose of residue according to local regulations. A second application may be required on porous surfaces as the biological activity in the oil remover brings ingrained oil to the surface. 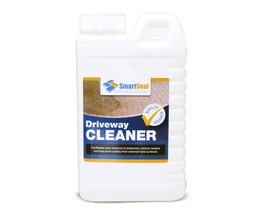 Penetrates and lifts most types of oil stains* from even the most porous paving surface. German UBA (3406-0001) Environmentally acceptable chemical. 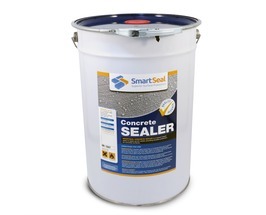 With an application rate of approximately 1 litre per square metre, Smartseal Oil Remover is simple to use and lifts most oil stains from the most porous surfaces. Brush into the stain until SMARTSEAL OIL REMOVER changes colour from white to brown. Leave for 20 minutes and water rinse. For heavy stains, cover area to retain moisture and leave for 7 days. A second application may be required on porous surfaces as the biological activity in the product brings ingrained oil to the surface. Not suitable for oil stains on Tarmac. Store in original containers and avoid extremes of temperature.